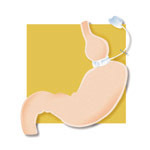 In the Adjustable Gastric Banding procedure, a band made of special material is placed around the stomach near its upper end, creating a small pouch and a narrow passage into the larger remainder of the stomach. The band can then be inflated with a saline solution through a reservoir (port) placed in the abdomen under the skin. It can be tightened or loosened over time to change the size of the passage by increasing or decreasing the amount of saline solution. The entire procedure is done laparoscopically, where a laparoscope is inserted through the abdominal wall through small surgical incisions. Click on the images for enlarged images. Find out more about Laparoscopic Adjustable Gastric Banding with the following links.